Knowing what kind of material your camper or RV is made out of is critical. Without knowing what your vehicle is constructed of, you won’t be able to maintain it properly. We all know consistent maintenance is what keeps our RVs and campers in great condition. In this article we’ll explore the different kinds of roofs popular in the RV industry—and what it takes to maintain them. Aren’t sure what your roof material is? Here’s how to tell. If you find yourself in a position to choose what kind of roofing material your RV or camper has, you’ll want to know what kinds of roof are available. You’ll also want to find out the benefits and drawbacks of each type. Rubber is one of the most common materials you’ll find used for an RV roof. Rubber roofs will be one of two different types. The first is Ethylene Propylene Diene Monomer (EPDM). The second is Thermal PolyOlefin (TPO). You’ll need to know which type of rubber roof your vehicle has, in order to best maintain it. Ideally, you should consult your owner’s manual or reach out to your manufacturer for specifications. If that’s not possible, however, there are a few things you can look for that will indicate what type of rubber roof you have. Streaking—if you notice any gray or white streaking down the side of your RV, you likely have EPDM as your roofing material. An EPDM roof will be slippery when wet—the TPO roof will not be. The texture of an EPDM roof is very smooth—it may also have a chalky look to it. A TPO roof will be heavily textured and bumpy—almost like an orange peel. The TPO roof will be quite shiny. If you’re anxious to know why you should move forward with a rubber roof, here are the reasons people love to have them. Rubber roofs are cheaper to maintain and repair. The low weight of a rubber roof is highly desirable. Rubber roofs are less slippery than other options—this is an important factor if you ever need to spend time on your roof, operating or maintaining appliances or fixtures located there. These roofs are less likely to experience weather-related damage than other types. Rubber roofs are environmentally friendly. You won’t have many options when it comes to what your roof looks like—if you don’t care for the look of the rubber roof, this may be a significant drawback for you. 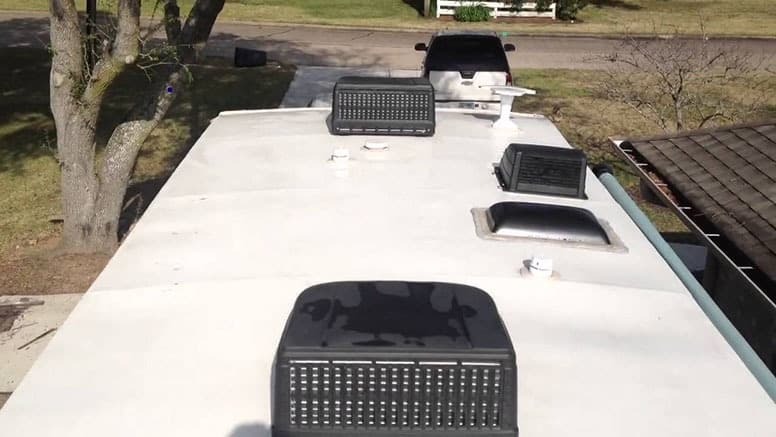 While some roofs are virtually maintenance-free, you’ll still need to take care of your RV’s rubber roof to keep it in good shape—if you aren’t interested in maintenance, you should consider a different roofing material. Fiberglass is another option for roofing material. You’ll recognize it by its hardness. It won’t be metallic, which may be helpful if you’re trying to determine if you have a fiberglass or aluminum roof. Fiberglass roofs are great looking—they’ll perfectly complement your RV in both color and style. 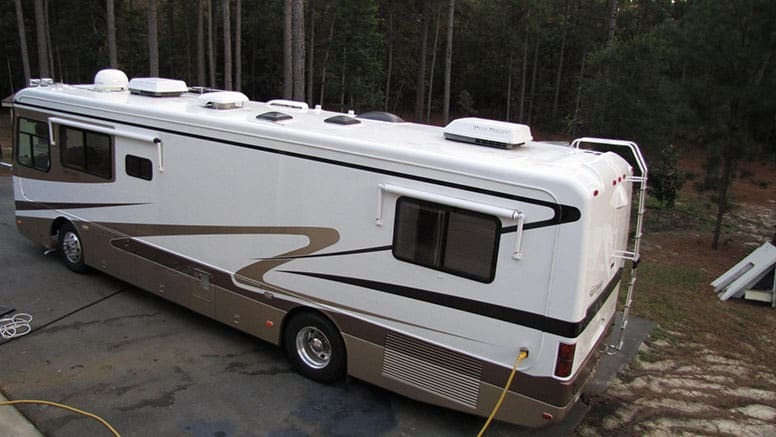 Fiberglass roofs are quite heavy, adding undesirable weight to a camper or RV. Fiberglass roofs are expensive—you may not have the money to invest in them or you might feel that money is best spent elsewhere. You won’t come across aluminum camper roofs very often. When you do, it will likely be on a vintage RV or camper. Like fiberglass, these roofs are hard. They’re obviously made of metal, so you can usually tell by look and touch that you have an aluminum roof. Aluminum roofs are quite low maintenance. Extremely hardy and resilient to tree branches and other obstacles your RV or camper may encounter while on the road. Very long-lived—this is a roofing material you can expect to last much longer than its softer counterparts. Aluminum is more expensive per square foot, and the install will also be more expensive. This kind of roof is quite heavy. May be easily dented by hail or other weather conditions encountered on the road. While not one of the most readily seen roofing materials, some RV roofs may be made of vinyl. Vinyl may closely resemble rubber, with a similar look and feel. Should you try to pinch it up, however, you won’t be able to do so successfully. Using vinyl for your roof is environmentally friendly. Vinyl roofs are strong and durable. Older or damaged vinyl may be difficult to repair. These roofs are not as cold-hardy as other options and may fail during cold weather. Still feel like you have more questions than answers? A local RV or camper shop will always be able to help you if you can’t determine your roof’s material on your own. If you’ve determined that you do have a rubber roof, you’ll need to plan on maintaining it. While the other roofs mentioned here have other weaknesses, they are essentially maintenance-free. This is not the case for a rubber roof. Moreover, the maintenance needs of an EPDM roof are different from those of a TPO roof. There are some guidelines you’ll want to follow when working with both roofing types, however. Wear soft-soled shoes—your roof can be easily damaged if you aren’t careful about the kind of footwear you have on when working on it. While your rubber roof will need regular cleaning, stay away from harsh chemicals and abrasives—petroleum distillates and citrus products should be avoided. Your EPDM roof will need regular cleaning. Plan on doing this at least every three months. The hotter and more humid the weather your RV has been exposed to, the more frequently it should be cleaned. Begin with a good sweeping to remove any physical debris. 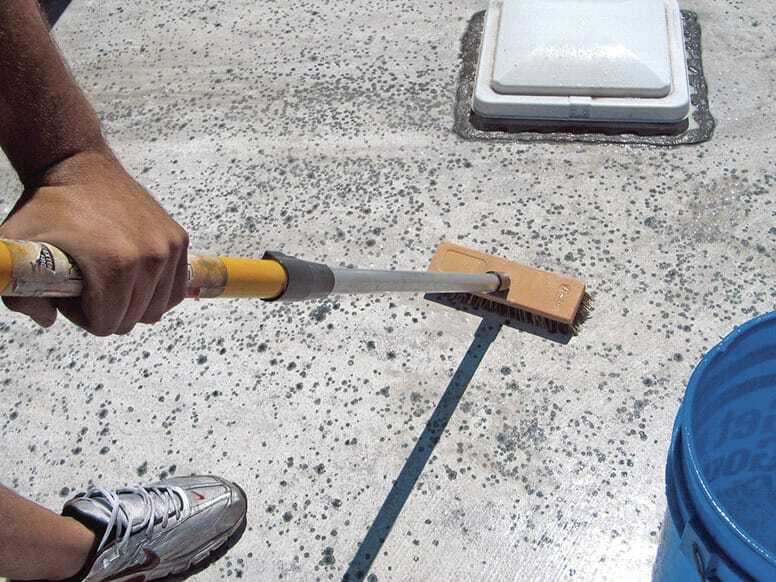 Afterward, mop with a gentle cleaning solution, such is the Dicor Corporation rubber roof cleaner, or according to your manufacturer’s recommendations. You may opt to cover the sides of your RV during this final step, as rinsing may lead to streaking. This will save you later work when you go to clean the body of your RV. Once your roof is freshly cleaned, take a good look at it. Identify any cracks or areas that need to be repaired. If found, fill in with a recommended caulking product to prevent the underlying structure from being damaged. Remember—surface repairs are inexpensive, but a replacement will set you back far more. You’ll also want to inspect the edges of the roof for any spots that are beginning to peel up, or where the self-leveling sealant has been compromised. If you find such spots, peel away what you can and replace it with fresh sealant. You should expect to freshen the caulk around your roof’s seams every year. This is a preventative strategy that will keep your roof—and interior—in its best shape, and add to the camper’s longevity. Keeping your TPO roof clean is just as important as keeping an EPDM roof clean. Begin by using a soft-bristled brush, water, and a non-abrasive cleaner. Be gentle and careful not to damage the top membrane of the roof. Avoid walking on the roof until after it’s been thoroughly rinsed. Once the roof is clean, you’ll need to inspect it for any damage, especially if it’s been exposed to extreme weather. Repairs can be made with a sealant tape or a patch kit. It’s not unusual to discover your RV has encountered a tree branch along its journeys and needs a little repair. As with an EPDM roof, you’ll want to make sure you maintain the caulk seal around your TPO roof. Some sealant tapes can be used for such purposes as well, should you prefer them. Whether you have a TPO rubber roof or an EPDM roof, If you’re looking to go the extra step, you can consider applying a rubber roof coating or protectant. This will help extend the life expectancy of your roof. You may become caught up in other maintenance when it comes to RVs. It’s possible you’re diligent about tire rotation, brake checks, and AC cleaning. Now you know that you shouldn’t forget about your roof. It can be easy to put off, but keeping your roof in good shape is the key to keeping the inside of your RV in great shape. Don’t risk thousands of dollars worth of damage by failing to put a little time and elbow grease into maintaining your roof. Have a favorite product you can’t live without when it comes to roof maintenance? Have a question we didn’t quite answer here? We’d love to hear from you. Leave us a comment below, and don’t forget to share the article with your camping buddies.